Minarets, from which Muslims are called five times a day for prayer, have been described as the 'gates from heaven and earth'. 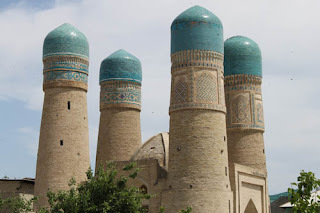 Derived from the Arabic word manārah, meaning lighthouse, Uzbekistan boasts some very fine minarets, and there are intriguing stories about many of them. On approaching Bukhara, travellers can see the Kalyan Minaret in the distance. 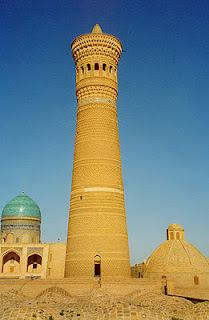 The caravans that plied the Great Silk Road during the Middle Ages used this minaret as a landmark. In 1127 Bukhara's ruler, Arslan Khan, commissioned the architect Bako to design a minaret to replace an earlier one that had collapsed. Bako laid the foundations of the minaret using bricks and mortar made of ganch-plaster mixed with camel's milk. He then left Bukhara and returned two years later, when the foundations had become as hard as stone. On these foundations he built the minaret later called Kalyan, which means ‘Great’. Made of baked bricks it is about 47 metres high with a 10-metre deep foundation. The strong, slightly tapered body of the minaret is topped with a cylindrical rotunda gallery of 16 arched windows. 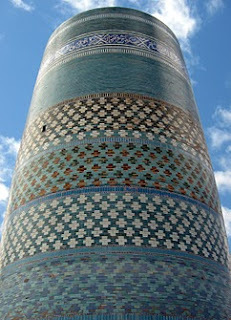 The entire surface of the minaret is covered with ornamental bands of brickwork and some turquoise glazed tile work. One of the lower bands contains the inscription with the year of completion and Arslan Khan's name. The upper frieze, which was lost during the restoration works, included Bako's name; his grave is located in the neighbourhood, and locals can point it out to you. This grand minaret, a symbol of Holy Bukhara, has been standing there for almost one thousand years. It has survived natural and political disasters: when Genghis Khan lay siege to Bukhara in the 13th century he was so smitten by its beauty that he spared it from destruction. Local legend has it that condemned criminals were led to the top and thrown off, earning it the nickname 'Tower of Death'. Also in Bukhara is Chor Minor ('four minarets'), a charming building dating from 1807, set in a local neighbourhood about a 15-minute walk from Lyabi Haus. to make every visitor to the madrassah understand that people who lived in different parts of the world had only one sky above and stood equal before God, the One and Only. The 17-meter towers are not strictly minarets as there are no galleries. However, it possible to climb them for views of typical Bukharan back streets. In Khiva a short, yet enormous minaret, stands before the facade of the Muhammad Amin-khan madrassah. This is Kalta Minor, which should have become the biggest and highest minaret in Central Asia. Its massive base is 14.2 metres in diameter and it was planned to be 80 metres high with views to Bukhara. However, construction was interrupted on the death of the khan in 1855 after a battle against the Turkmens. Legend has preserved a better version: the Bukharan khan learnt about the construction of a grandiose minaret in Khiva, and negotiated with the architect to build an even taller one in Bukhara. The Khivan khan was furious when he heard and ordered that the architect be thrown from the minaret. Decoratively speaking, the bright blue minaret of Kalta-Minor is unequalled in Central Asia. It is the only minaret entirely covered with coloured glazed tiles. 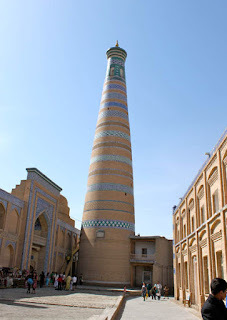 Khiva is also home to the Islam-Khodja minaret and madrassah. Islam Khodja was vizier to Muhammad Rahim-khan II and his son Esfendiyar-khan of Khiva. Islam-Khodja financed the construction of a hospital, pharmacy, post and telegraph office and secular schools in Khiva. In 1908 -1910 he built an ensemble of buildings in the southeastern part of Khiva's old city, the Ichan-Qala. It consisted of the smallest madrassah in Khiva and the highest minaret, imitating the ancient minarets of the 11th and 12th centuries. The minaret's height is 57 metres, including the foundation. The top platform, at a height of 45 metres, is the highest observation point in Khiva. Horizontal belts of dark blue, white, blue and green glazed mosaic decorate the minaret. For a very small fee you can climb the minaret's dark staircase up 118 steps for views of the city and desert. In 1417 the ruler Ulugbek, (grandson of Amir Timur) began building a madrassah in Samarkand. This forms part of the exquisitely harmonious Registan square. He was a gifted astronomer and mathematician, and on the majestic portal of the madrassah is the inscription 'to strive for knowledge is the duty of every Muslim man and Muslim woman'. The madrassah's corners are flanked by high, well-proportioned minarets, which were never used by muezzins: there were said instead to hold up the sky. 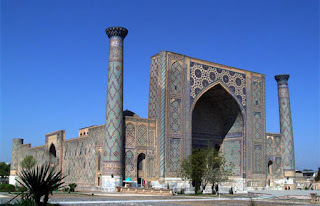 It is possible to climb one of the minarets early morning for glorious views of Samarkand. Amir Timur's monumental 15th century mausoleum, Gur-e Amir, although heavily restored, is breathtaking in design. With its central dome and arched entrance flanked by mirror-image minarets, it served as the model for the mausoleum of Hamayun, the 2nd Mughal Emperor of India, and many other Mughal architectural masterpieces. It contains the tombs of Timur, his sons, grandsons and his spiritual teacher. In June 1941 Stalin sent Soviet scientist Mikhail Gerasimov (a pioneer in facial reconstruction of historical figures) to Uzbekistan with a team of archaeologists to open the tombs of Timur and other members of the Timurid dynasty. Legend tells that the people of Samarkand protested against the opening, claiming that digging out the bodies would lead to a catastrophe. It is also said that when Gerasimov exhumed the body, an inscription inside the casket was found reading, "When I rise from the dead, the world shall tremble". Two days after Gerasimov had begun the exhumation, Hitler launched Operation Barbarossa, Germany's invasion of the Soviet Union. Timur was re-buried with full Islamic ritual in November 1942 just before the Soviet victory at the Battle of Stalingrad, the turning point of the Great Patriotic War. All these sites are visited on Uzbek Journeys tours. 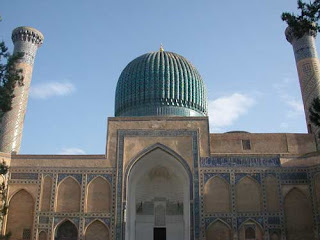 In Uzbekistan, minarets are no longer used for calls to prayer.